Ka-ching! 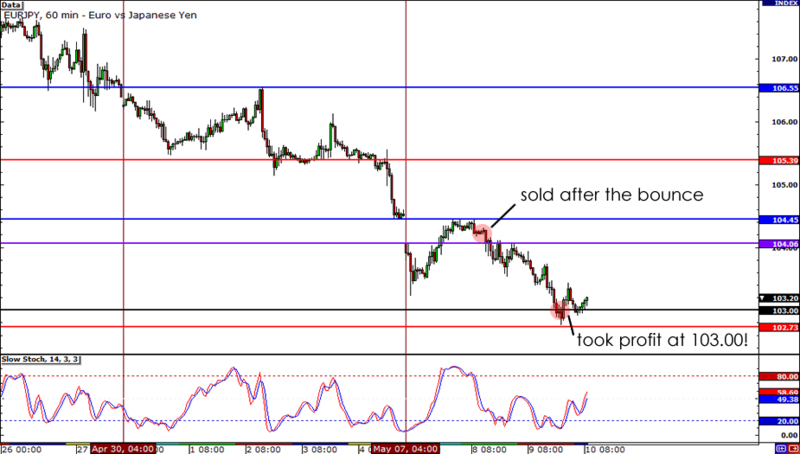 This trade worked like a charm and EUR/JPY hit my profit target without a hitch. Congratulations to those of you who joined me on this one. We deserve a pat on the back! What’s cool about this trade is the drop wasn’t cause by a single event. Risk sentiment just seemed to guide the market lower as investors remained risk averse in light of the recent political developments in the euro zone. Aside from the region’s political problems, word on the street is that Greece might not receive the next tranche of its bailout package. They even say that it may only be a matter of time before it gets the boot from the euro zone! With that hanging over market players’ minds, a fresh round of selling began on Tuesday as London traders returned from a three-day weekend. Sweet! In retrospect, it seems I picked a great place to take profit too, because once price hit the 103.00 area, it stalled! It looks like this week’s Weekly Watch was spot on! Now, if only every trade went as smoothly as this. Hah! That’s all for this week, folks! Thanks for following and happy trading! The euro may have recovered some of its losses and even filled the gap against the yen yesterday, but that doesn’t mean I’m switching over to the bull camp! It just gives me a nice opportunity to load up on a short position! Why am I bearish on the euro right now? Euro zone politics, baby! Francois Hollande, the newly elected French President, built his campaign around the promise of fighting against austerity measures. He has also said that he wants to renegotiate some of the items that centered around budget discipline in the European Treaty that German Chancellor and former French President Sarkozy worked so hard on. Meanwhile, on the other side of Europe, political party Syriza won the second most seats in Parliament in the recent Greek elections. Traditionally, the New Democracy and Socialists parties have held the most seats and have teamed up to form a majority government. The problem with this is that Syriza feels that current austerity measures are already too much and will most likely not conform to the ideals of the other two parties. I think these political problems could spell much uncertainty in the markets and could weigh heavily on the euro if they are not resolved. And to be honest, I’m not betting on anyone playing nice. 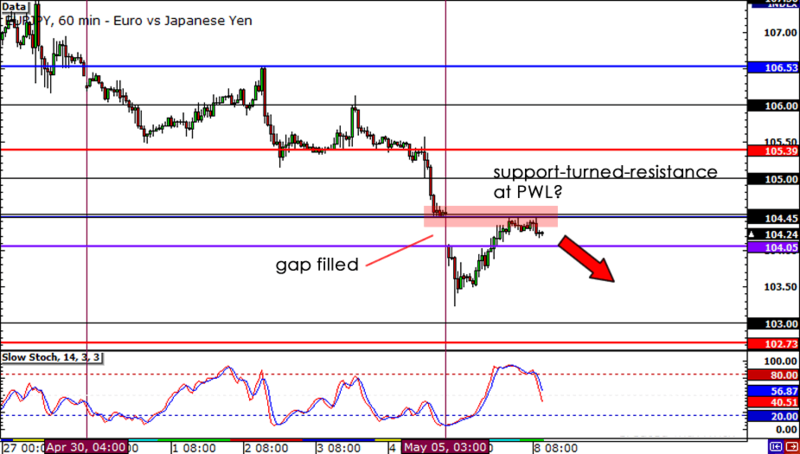 Now that the gap has filled on EUR/JPY, I highly doubt we’ll see the pair rise any further. I feel that the markets are just being too cautious right now and would much rather park their funds in the safe havens. Shorted EUR/JPY at market (104.19), stop at 105.10, take profit at 103.00. I placed my stop loss above the 105.00 handle. I think if price reaches that area, it would signal that conditions have changed and that the markets are no longer as pessimistic about the state of European politics. As for my profit target, I’ll be aiming for the 103.00 handle, which I think is a feasible target given the current sentiment. If everything goes my way, I’ll be coming home with a reward-to-risk ratio of just about 1.3:1, which ain’t too bad. Lastly, I’ll be risking 0.75% of my account on the trade. Gotta keep my risk in check yo! Will the previous week low (PWL) hold as resistance?